Aaron Woodbury was born on January 24, 1818 in Thornton, Grafton County, New Hampshire. Find A Grave Memorial# 64166315. 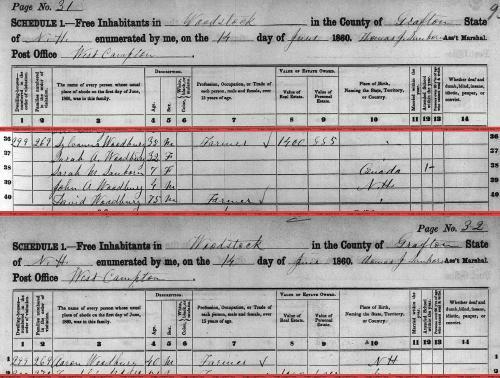 "United States Census, 1900," database with images, FamilySearch (https://familysearch.org/ark:/61903/1:1:M3YW-HN9 : accessed 9 December 2016), Freeman A Woodbury, Thornton town, Waterville town, Raymond grant (part adjoining Hatch and Cleaves Grant on south, Grafton, New Hampshire, United States; citing enumeration district (ED) 74, sheet 4B, family 101, NARA microfilm publication T623 (Washington, D.C.: National Archives and Records Administration, 1972. ); FHL microfilm 1,240,946. Record added: Mar 06, 2010. 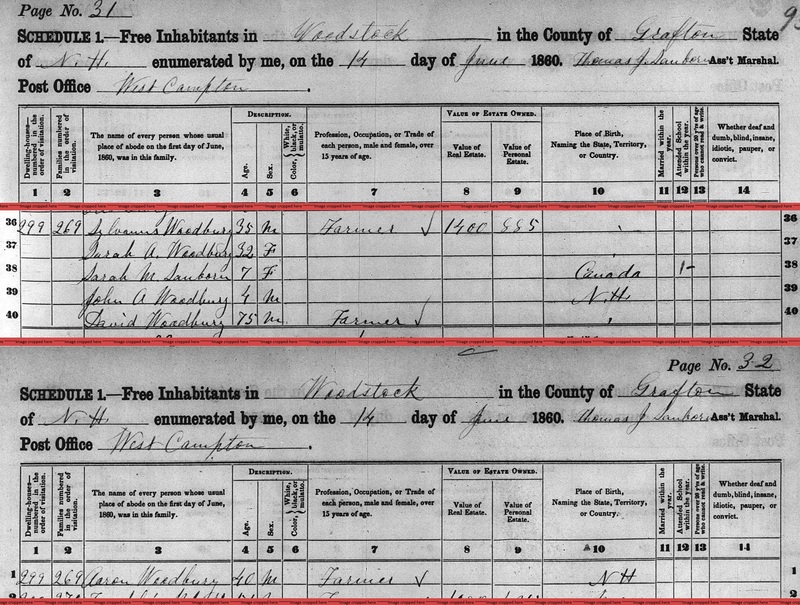 "New Hampshire Marriage Records, 1637-1947," database with images, FamilySearch (https://familysearch.org/ark:/61903/1:1:FLFL-ZST : 12 December 2014), Albert F. Woodbury and Eunice F. Buswell, Feb 1874; citing Thornton, , New Hampshire, Bureau of Vital Records and Health Statistics, Concord; FHL microfilm 1,001,320. 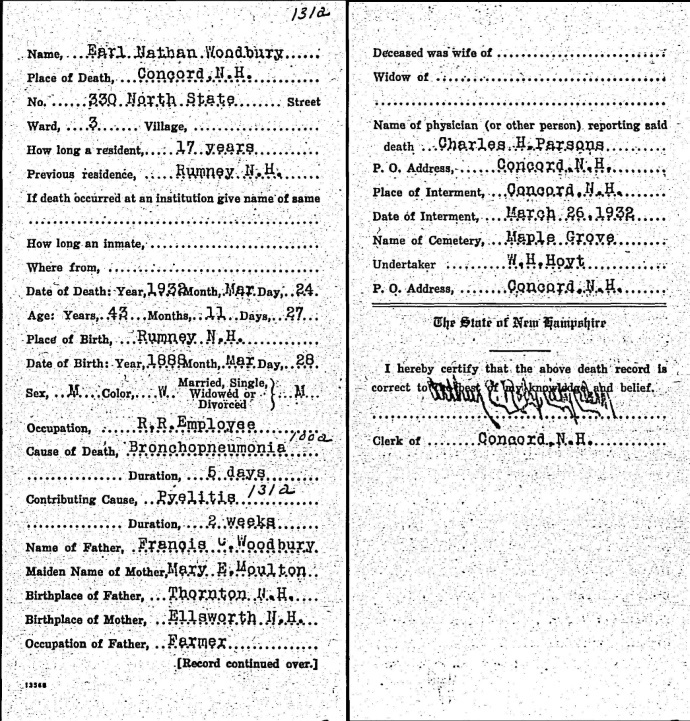 "New Hampshire Death Records, 1654-1947," database with images, FamilySearch (https://familysearch.org/ark:/61903/1:1:FSVP-LQ9 : 12 December 2014), Freeman Woodbury, 18 Jun 1902; citing Thornton, , New Hampshire, Bureau Vital Records and Health Statistics, Concord; FHL microfilm 2,131,637. Caleb Stark, History of the Town of Dunbarton, Merrimack County, New-Hampshire, from the Grant by Mason's Assigns in 1751 to the Year 1860, , at https://books.google.com/books?id=Cv7hcQ8-5bIC . Concord: G. Parker Lyon, (1860) , p. 132. Church of Jesus Christ of Latter-day Saints. Salt Lake Temple, IGI reference to Endowments for the dead, 1893-1970; heir indexes, 1924-1956; baptisms for the dead, 1941-1970, Salt Lake City: Filmed by the Genealogical Society of Utah, (1959-1979) , Film Number: 184313, Page Number: 45, Reference Number: 1022. Church of Jesus Christ of Latter-day Saints. St. George Temple, IGI reference to Baptisms for the dead, 1877-1974; heir indexes, 1877-1956, Salt Lake City: Filmed by the Genealogical Society of Utah, (1956, 1974) , Film Number: 170877, Page Number: 677. Church of Jesus Christ of Latter-day Saints. Salt Lake Temple, Sealings of children to parents, 1893-1942; heir indexes, 1893-1942, Salt Lake City: Filmed by the Genealogical Society of Utah, (1958) , Film Number: 1239647, Page Number: 368, Reference Number: 13004. Your Woodbury/Ober Family Web Site, at http://www.woodburyober.com/d9.html citing NH State Vital Records, Concord, NH. Unfortunately, this website no longer exists. Daniel Levi Woodbury was a private in Company B, 1st New Hampshire Heavy Artillery during the Civil War. About 1865 Daniel Levi Woodbury and Moses H. Woodbury served in the War of the Rebellion, co. B, 1st Regiment, Volunteer Heavy Artillery. 1880 United States. Census Office. 10th census, 1880 federal population census, Washington, District of Columbia: National Archives and Records Service, ([19--]) , FHL Film 1254763; National Archives Film T9-0763; Page 54B. He and Mary Woodbury were buried in Woodstock Cemetery, Woodstock, Grafton County, New Hampshire. "New Hampshire, Death Records, 1654-1947," index and images, FamilySearch (https://familysearch.org/pal:/MM9.1.1/FSLV-ZX6 : accessed 08 Nov 2012), David Woodbury, 03 Jan 1885. 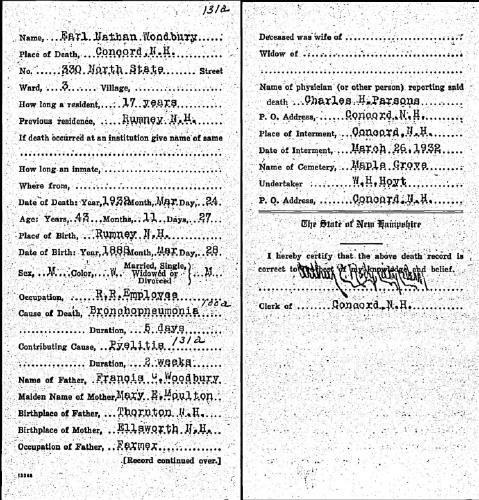 "New Hampshire Birth Records, Early to 1900," database with images, FamilySearch (https://familysearch.org/ark:/61903/1:1:FL5C-VR9 : 12 December 2014), Ebenezer Woodbury, 26 Sep 1763; citing Salem, Rockingham, New Hampshire, United States, Bureau of Vital Records and Health Statistics, Concord; FHL microfilm 1,001,055. Caleb Stark, History of the Town of Dunbarton, Merrimack County, New-Hampshire, from the Grant by Mason's Assigns in 1751 to the Year 1860, , at https://books.google.com/books?id=Cv7hcQ8-5bIC . Concord: G. Parker Lyon, (1860) , p. 17. Caleb Stark, History of the Town of Dunbarton, Merrimack County, New-Hampshire, from the Grant by Mason's Assigns in 1751 to the Year 1860, , at https://books.google.com/books?id=Cv7hcQ8-5bIC . Concord: G. Parker Lyon, (1860) , p. 218.